so what has your pal niqui been up to lately? 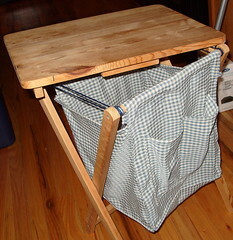 Well, I built a contraption a couple of Sundays ago: I took a $5 Ikea tv tray table that I got about 7 years ago, which had lost a couple of screws and was unsteady on its pins, disassembled it slightly, and turned it into a knitting caddy (with a tabletop! ), to keep all my chairside knitting stuff sorted and away from cat-related damage. So that’s kind of cool. I can keep a couple of projects in the caddy, it has pockets on the side for accessories, and the tabletop is removable so I can still use it as a table. The caddy bit is removable and washable, and it still mostly folds up, if I don’t mind moving the tabletop separately, and all it cost me to make was a $5 hacksaw and a $2 dowel. Rock! I also did some spinning. I can’t spin in the wintertime (which is deeply annoying) because the skin on my hands gets too dry to handle fiber (and there is no lotion that helps this, I’ve tried — climate changes help, actually, so travelling in January actually healed my hands up a bit), but I have gotten a bit done in the past couple weeks. I finished up spinning the last of an 8oz. 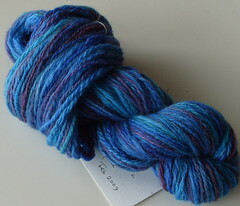 hank of Frabjous Fibers Blue-Faced Leicester in the “Deep Space” colorway. I drafted the full width of the roving out to pencil roving (so I had nice long chunks of colors) and navajo-plied it to preserve the color changes and shade neatly from color to color — came away with 540 yds of slightly-more-than-worsted,-not-quite-chunky weight yarn. Here’s a hank. I have four hanks now and I just want to sit and pet them. My pretties! I’ve also been working on Johnny’s Guitar Hero scarf. I changed it from crochet (in the pattern) to a broken-rib stitch, and am about halfway done — no pix, though, it’s not very interesting yet. But Johnny’s in a Guitar Hero tourney in a month so I have to get it one before then! And, since I’ve been wearing the hell out of the last one I made, I went stash-diving for some soysilk laceweight I knew I had in there somewhere and cast on for a third Clapotis. 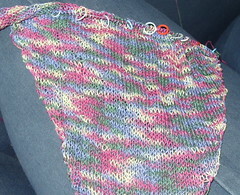 It’s nice to have a little mindless-yet-interesting knitting in there you can default to. 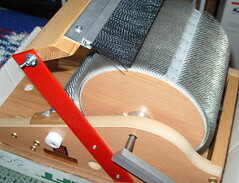 Even if the laceweight does move annoyingly slowly, on #4 needles. It’s turning out pretty nice, I think I’ll be pleased with it when it’s done. So that’s the news from the south loop. But now: big bio test to study for, and batts to spin! Quick! To the bat-comfy chair!